The Mongolic leids are a group o leids spoken in Central Asie, notably includin Mongolian. Mongolic is whiles grouped wi Turkic an Tungusic as pairt o the lairger Altaic faimily. The best-kent member o this leid faimily, Mongolian (in Cyrillic orthography as uised in Mongolie, Монгол Хэл, an in the vertical Uyghur-derived script as uised in Inner Mongolie, Cheenae, Mongγol Kele), is the primary leid o maist o the residents o Mongolie, an is spoken bi aroond 5.7 million fowk in Mongolie an Cheenae. This classification is ae ane amang mony. Notably, thare is a tendency amang Mongolian linguists tae include Central Mongolic, Wastren Mongolic an Northren Mongolic intae ane "Mongolian leid" as opposed tae the rest o the leids which are then labelled as "Mongolic". This mey depend on Mutual intelligibility, but an analysis based on a tree diagram sic as the ane abuin faces ither problems due tae the close contacts aetween e.g. Buryat an Khalkh Mongols durin history sicweys creatin or preservin a dialect continuum. Anither problem lies in the sheer comparability o terminology as Western linguists uise leid an dialect, while Mongolian linguists uise the Grimmian trichotomy leid (kele), dialect (nutuγ-un ayalγu) an Mundart (aman ayalγu). The Mongolic leids oreeginatit frae the Proto-Mongolic leid that wis spoken at the time when Genghis Khan unitit a nummer o tribes speakin Late Pre-Proto-Mongolic leids. The Proto-Mongolic leid is the oreegin o aw subsequent Mongolic leids. Insofar as its elements are preserved in thir les, it is possible tae speak o Common Mongolic. Thare are leids believed tae be relatit tae Proto-Mongolic, namely Tabghach (the leid o the foonders o the Northren Wei dynasty) an Khitan. In the case o Tabghach, the survivin evidence is vera sparse, sicweys ane can state that a generic relationship is possible. In the case o Khitan, thare is rich evidence, but maist o it is written in the twa Khitan scripts that hae as yet no been fully deciphered. Housomeivver, frae the available evidence it haes tae be concludit that a generic relationship tae Mongolic is vera likely. The common ancestor leid o thir twa leids an Proto-Mongolic micht be termed Pre-Proto-Mongolic. The first survivin Mongolian text is the Stele o Yisüngge, a report on sports in Mongolian script on stane, that is maist aften datit tae aboot 1224 or 1225. Ither early soorces are written in Mongolian, Phagspa (decrees), Cheenese (the Secret history), Arabic (dictionaries) an a few ither wastren scripts. Thir comprise the sae-cried Middle Mongolian leid that wis spoken frae the 13t tae the early 15t or late 16t century. The documents in Mongolian script show some distinct linguistic characteristics an are therefore aften distinguisht bi termin thair leid Preclassical Mongolian. The next distinct period is Classical Mongolian that is datit frae the 17t tae the 19t century. It is a written leid wi a heich degree o staundartization in orthography an syntax that sets it quite apairt frae the subsequent Modren Mongolian. The maist notable documents in this leid are the Mongolian Kanjur an Tanjur as well as a nummer o chronicles. Middle Mongolian an aa includes mony Turkic loanwirds, especially frae Auld Turkic, which are still uised in modren Mongolian leid. Γarudi (2002): Dumdadu üy-e-yin mongγul kelen-ü bütüče-yin kelberi-yin sudulul [The study o grammatical forms in Middle Mongolian]. Kökeqota: Öbür mongγul-un arad-un keblel-ün qoriy-a. Janhunen, Juha (ed.) (2003): The Mongolic languages. Lunnon: Routledge. Janhunen, Juha (2003a): Written Mongol. In: Janhunen 2003: 30–56. Janhunen, Juha (2003b): Para-Mongolic. In: Janhunen 2003: 391–402. Janhunen, Juha (2003c): Proto-Mongolic. In: Janhunen 2003: 1–29. Rybatzki, Volker (2003): Middle Mongol. In: Janhunen 2003: 47–82. 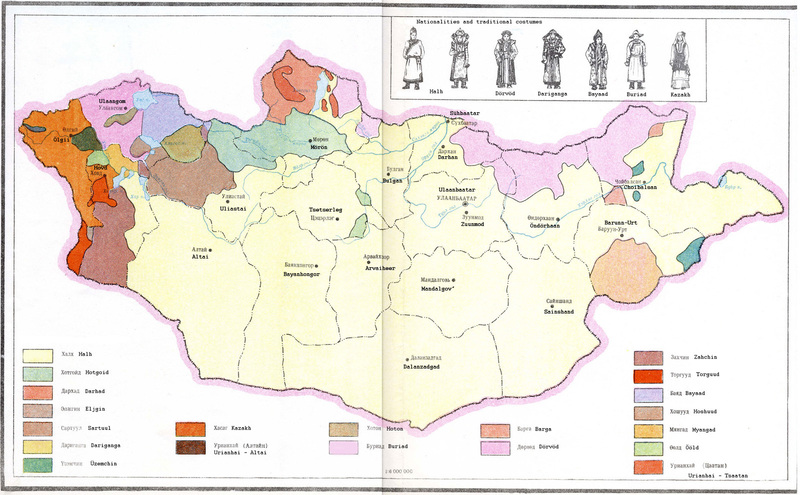 Sechenbaatar, Borjigin (2003): The Chakhar dialect of Mongol – A morphological description. Helsinki: Finno-Ugrian society.